After doing research for an essay for my nutrition and the environment class, what I learned is if you eat processed food, you are most definitely consuming sugar, and most of the time you won’t even know it. Processed foods are the ultimate master of disguise, and sugar is its favorite costume, because there are so many characters to dress up as. If processed foods were an animal, it would be a chameleon, able to change face and adapt to its environment. As a society, we have adapted to processed food, and we are used to its taste, smell, and familiarity. It has become part of the normal North American environment, and, as a result, sugar is one of the top villainous additives around today, up there with nicotine. In the U.S., they average 20 teaspoons of added sugar each day, in addition to sugar naturally found in whole foods. That works out to about 150 pounds a year! 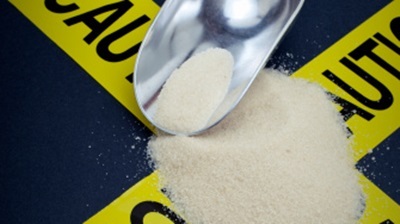 How many different crimes do sugar or sweeteners commit? The overconsumption of sugar contributes to obesity, immune problems, teeth problems, yeast problems, diabetes, attention deficit syndromes, hypoglycemia, and candida. Healthy foods, needless to say, do the opposite: healthy foods can help prevent obesity, high cholesterol, and high blood pressure. How do we fight back against this sugar villain? We can make three important life changes to help save the world from sugar, and be the heroes. 1. Eliminate processed foods by finding better alternatives for your diet: healthy foods. Look to cut certain processed foods from your diet first. Here are 10 names to look for the next time you’re in the grocery store. This is our typical white sugar, naturally found in sugar cane, maple syrup, sugar beets, sorghum, molasses, and pineapple. It’s found excessively in processed foods such as beverages, ketchup, mayonnaise, salad dressings, and baby foods. We get fructose naturally from honey and fruit, and estimations suggest that about 10% of the modern diet comes from fructose alone. It is commonly paired as glucose-fructose. Don’t be fooled: when your healthy foods contain fructose, it’s just another word for sugar. When sugar is metabolized, you get glucose. Salad dressings, barbecue sauces, ice cream toppings, maraschino cherries, processed maple syrups, sodas, relish, cheese slices, and raspberry jam are examples of where this hidden sugar is found. Lactose contains a molecule of both glucose and galactose. Common processed foods containing lactose include, milk, cheese, cream, and yogurt. Problems associated with lactose include milk digestion, or lactose intolerance. In the U.S., an estimated 50-60 million people have the intolerance. Dextrose, or D-glucose, is the dextrorotatory form of glucose, also called corn sugar. It can be found in many processed foods, sweets, and corn syrup. Avoid so-called healthy foods filled with dextrose. Caramel is a food additive produced by heating various sugar sources, such as corn (dextrose), cane (molasses), and dairy (lactose). It can be found in sweets, breads and pastries. Chocolate bar companies always promote snacks with caramel, such as Mars. It is a sweetening agent, similar to brown sugar, yellow sugar, or turbinado. It is used to sweeten processed foods, such as beverages, smoothies, and plain yogurt. High fructose corn syrup is basically liquid sugar which can be found in soft drinks, sauces and salad dressings, breads, breakfast bars and cereals, and processed snacks. Various manufacturers will use maltose derivatives as preservatives or sweeteners in several processed foods, such as maltodextrin and high-maltose corn syrup. Maltose can be found in beers, malted snacks, various breakfast cereals, and many crackers. Candies, baked goods, soft drinks, and beer are definitely not healthy foods—they contain high-maltose corn syrup, and canned fruits, sauces, dressings, sports drinks, and desserts contain maltodextrin. Aspartame is an artificial sweetener that is not recommended in large quantities. Some products containing aspartame are chewing gums, candies, and soft drinks. Take these off your list of healthy foods! Natural sweeteners are honey, molasses, maple syrup, or brown rice syrup, and are good alternatives than sugar; however, even these should only be 10% of your diet, at a maximum. Haas, E., et al, Staying Healthy with Nutrition: The Complete Guide to Diet and Nutritional Medicine (New York: Ten Speed Press, 2006), 30-32, 451-452, 754-755. Sugar, J., “Who You Calling Sugar?”Pop Sugar Fitness web site, Feb. 17, 2010; http://www.fitsugar.com/Other-Names-Sugar-Appear-Labels-810571. Lee, H., “The Many Names of Sugar,” Prevention web site, November 2011; http://www.prevention.com/health/diabetes/hidden-sugar-food-labels. “6 Popular Foods with High-Fructose Corn Syrup,” FitDay web site; http://www.fitday.com/fitness-articles/nutrition/healthy-eating/6-popular-foods-with-high-fructose-corn-syrup.html. Kamps, A., “Common Food Sources of Maltose,” LiveStrong.com web site, Aug. 20, 2011; http://www.livestrong.com/article/521794-common-food-sources-of-maltose/. “Types of Sugars,” Canadian Sugar Institute web site; http://www.sugar.ca/english/consumers/typessugar.cfm.